You may know Thule from their vehicle racks for all sorts of travel and sport related endeavors. 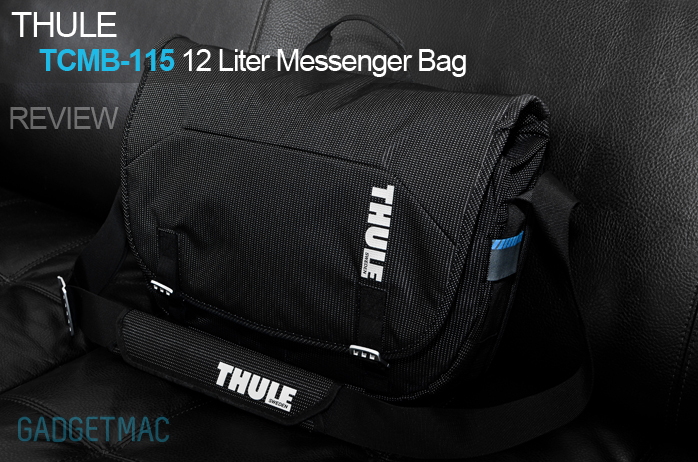 Thule's TCMB-115 or other known as the Crossover Messenger Bag is one of the most amazing bags you will ever set your hands upon. It's screams quality and good looks. I've never got the chance to use a Thule product so this is a first for me and I'm already in love. Everything from the design to the little details makes this bag the best friend for tech driven people. The Thule Crossover Messenger Bag can pack all your gadgets and documents in a sleek and modern package that is also TSA airport security friendly. If you're in the market to get yourself bag, look not further. This is the messenger bag you won't want to miss. Check out the full review right after the cut. I don't know what it is about Swedish companies getting almost everything perfect. I've had only great things to say about the Swedish headphone maker JAYS, which continued to impress with their quality, design and affordability of their in-ear earphones. I love it when I get to review something really awesome that I think everyone will love as much as I do. Thule's color scheme just works with the whole concept of gadgets and travel. The Crossover Messenger Bag is not a small bag and can hold up to 3 gallons (12 liters) of your stuff with a well padded notebook compartment that fits a MacBook pro or PC up to 15". This bag has a very high quality construction and it feels very durable. You won't find anything cheap here, the strap adjustment buckles are made out of tough aluminum and won't easily break like plastic ones. Even the adjustble flap buckles are made out of aluminum and you can adjust them according to the load you're carrying. Taking a closer look at the Crossover's outside material reveals a unique texture and pattern that is tough and weather and water-resistant keeping all of your valuable gadgets safe and dry. The silver logos are light reflective adding a bit of safety when you're out and about at night. There are a total of 7 compartments that are all easily accessible. Opening the front flap of the Crossover Messenger Bag you will be presented by 4 front compartments fallowed by the main compartment as well as another small zippered inner compartment. There is no denying how much space there is available here. Keep in mind though that this is a messenger bag so you will be able to fit things that don't bulge out and have bulky form factors as the Crossover has a pretty slimmed profile. The main compartment is great for storing magazines and a few text books if you're a student but that is pretty much it. By now you may be thinking this is a pretty expensive bag. The good thing is that it really isn't expensive at all considering what you get, this bag is a big bang for your buck. There is so much detail put into designing the Crossover bag like this built-in protective hard shell pouch also called the SafeZone crush-proof compartment that can store your iPhone even with a case on or your glasses and other fragile gear. The small pockets are good for storing earphones, pens, external hard drives, memory cards, cables and other similar things. Moving into the main compartment under the front flap where you can store an Apple Wireless Keyboard connected to a Magic Trackpad using the Twelve South Magic Wand. You can also store a pair of portable headphones that can fold up along with your notebook's power adapter. After storing all of those things, there was still enough room for even more. The bright colored interior makes it easier to find smaller things that are way down inside the deep compartment. The material used is just a simple nylon, but the smaller pockets are lined with a soft felt fabric. Getting into the comfort side of things, the Crossover Messenger Bag outdoes itself. The back side is extremely well padded to make carrying a heavy load an easy and enjoyable task. Thule's conception of creating a padded exterior really shows how much time went into designing this bag. If you're going to use a messenger bag as your daily bag, the Crossover will get the job done very well in a comfortable way. You do need to ask yourself if you need the extra storage capacity this bag can handle because it's not just a notebook bag, it's a bag that will get all of your mobile stuff into one place for travel. The shoulder strap is nicely padded and feels very rugged. If you use a rolling luggage, the Crossover's discrete pass-thru sleeve lets you attach it to most rolling luggage. Finally we get to the back compartment which fits a notebook of up to 15". This is the most padded and secured compartment in the whole Crossover Messenger Bag. It's positioned closest to your body and it's well padded all around to keep your expensive gear safe and sound. Just for example I used my 13" MacBook Air which fits perfectly and the velcro strap keeps it tightly in place. This would also be a good place to keep your iPad or any other tablet in the opposite mesh compartment. This would still be a protected and padded area. Whether you need a messenger bag for your daily use or a special cross country travel bag to keep your most valuable gear with you at all times, the Thule Crossover Messenger Bag is the one to get. At $99.99, this messenger bag is hard to beat. The quality is top notch and Thule has just won me over with their excellently designed product. I just wish Thule would make a smaller sized version of the Crossover Messenger Bag.